Eugene Washington Ferris was the great-great-great-great-great-grandson of Jeffrey Ferris. During the American Civil War he rose to the rank of First Lieutenant in the 30th Massachusetts. For his valor in combat in Berryville, VA. on April 1, 1865 he received the Medal of Honor. It’s not that simple, however. 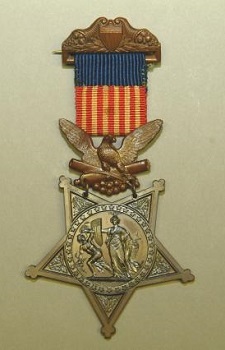 At the time, the sole medal for valor awarded by the United States Army was the Medal of Honor. And, Lt. Ferris got himself into his predicament over a woman, it would appear. Rank and organization: First Lieutenant and Adjutant, 30th Massachusetts Infantry. Place and date: At Berryville, Va., 1 April 1865. Entered service at: Lowell, Mass. Birth: Springfield, Vt. Date of issue: 16 October 1897. Citation: Accompanied only by an orderly, outside the lines of the Army, he gallantly resisted an attack of 5 of Mosby’s cavalry, mortally wounded the leader of the party, seized his horse and pistols, wounded 3 more, and, though wounded himself, escaped. Now, why would our Lt. Ferris be outside the lines of the Army? The Fairfax Times, on June 23, 2004, tells the rest of the story. On the morning of April 1, 1865, Lt. Ferris was given permission by Capt. Shipley of the 30th Massachusetts to go outside the federal lines at Opequon Crossing, attended by an orderly (McLaughlin of Co. I). He proceeded about three miles east into Clarke County to the home of Col. Daniel Bonham, where he halted and led the horses to the stable, a short distance from the house. While returning from Leesburg on March 30, Charlie Wilshire of Mosby’s command met Col. Mosby, who informed him that he was promoting him to lieutenant of Company H, and at the same time ordered Wilshire to proceed on a scouting expedition to Stephenson’s Depot on the Winchester and Potomac Railroad in Frederick County. Ferris walked outside and saw five of Mosby’s men coming toward the house from Berryville. Ferris ran to the stable and told his orderly to get their horses ready. While in the stable he heard the Rebels as they galloped into the yard. He went to the door, looked out and saw Wiltshire. The Confederate rode toward the stable and said, “Good Day – surrender.” Ferris replied, “Good Day, but I never surrender with life,” and shot Wiltshire through the neck. Check the link to the Fairfax Times for the much more detailed story. Needless to say, there is more. However, the young Miss Emma Bonham does not appear. The events of the day may have cooled Lt. Ferris’s ardor. Emma married a William Perry in 1866.